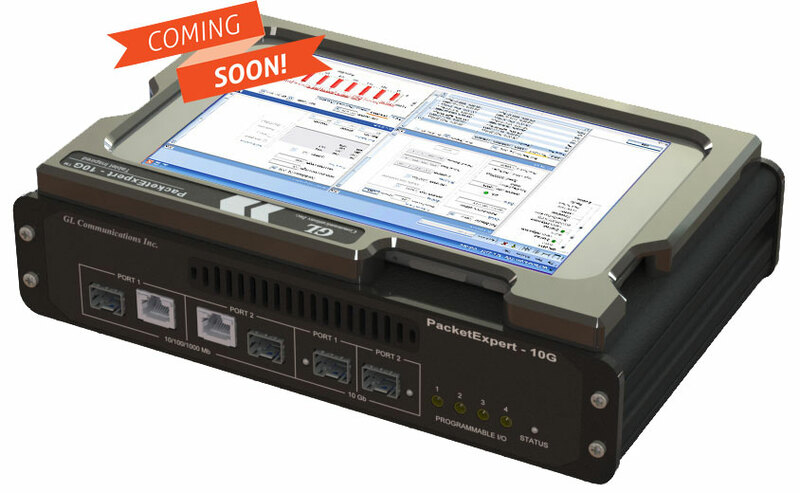 Gaithersburg, Maryland, USA – November 24, 2015 - GL Communications Inc., announced today its enhanced Next Generation Ethernet/IP Tester referred to as PacketExpert™ 10G that supports comprehensive testing of 10G and 1G Ethernet/IP networks. He briefly explained on the new functionalities introduced, “Wirespeed Record application supports capturing traffic on both the 1G and 10G ports at full line rate simultaneously (10 Gbps * 2/1 Gbps *2), without disturbing the link. Internal 8GB of DDR3 memory allows capturing up to 8GB of traffic (from both ports) at full Wirespeed (10 Gbps/1 Gbps). The captured traffic can be transferred to the host PC for offline analysis. Capture formats supported are PCAP, NGPCAP (popular wireshark formats), DAT (GL proprietary Raw format), HDL (GL proprietary PacketScan™ format). Wirespeed Playback allows playback of canned traffic files (in PCAP/NGPCAP/DAT/HDL formats) over one/both ports at full 10Gbps rate, allowing real world conditions to be recreated in lab. IPLinkSim™ emulates a bidirectional IP WAN link with varying capacities from 10 Mbps to 1 Gbps for the electrical interfaces, and up to 10Gbps on the optical interface. This application can be used to test performance of applications that uses Ethernet /IP based transport such as Web Services, Email, FTP, Database access, Enterprise Networks, Storage, Cloud Services, VoIP Services, Audio/Video Streaming and so on. It offers an efficient and economical way to emulate terrestrial, wireless, Internet, satellite, or private network links. IPLinkSim™ can simulate all network impairment conditions of real world networks such as network latency, network delay variation (jitter), bandwidth, congestion, packet loss, packet FCS errors, packet bit errors and others. The link impairments can be applied independently to both directions. ExpertSAM™ application is used to validate Ethernet Service Level Agreements (SLAs) as per ITU-T Y.1564 standard. It supports the two key Y.1564 subtests, the Service Configuration Test (SCT) and the Service Performance Test (SPT). SLA parameters measured include the Throughput, Frame Transfer Delay (FTD), Frame Delay Variations (FDV), and Frame Loss Ratio (FLR) service acceptance criteria to validate the network path under test. Up to 16 streams can be tested with full Wirespeed (10 Gbps/1 Gbps). The PacketBroker application allows PacketExpert™ to capture packets at Wirespeed (up to 10 Gbps/1 Gbps) non-intrusively over Ethernet (Electrical) and Optical ports at nano-second precision. PacketBroker supports both Tapping (Pass through mode), and Tap-Filter-Aggregate-Modification modes.